It’s the type of gathering you would expect to see in one of the most cannabis-friendly states in the country (Colorado) on the eve of the biggest holiday for potheads (4/20) with a premier marijuana event in town (the High Times US Cannabis Cup). The big surprise, however, is the name of the company co-sponsoring the event: Dixie Elixirs & Edibles, a marijuana-infused products manufacturer that built its business catering to medical cannabis patients. The decision to get involved in the “green carpet screening” of a movie about a pot-smoking superstar who appeals to the mainstream cannabis culture represents an about-face for the company. Dixie previously shied away from taking a prominent role – or participating at all – in such events, opting instead to participate in gatherings aimed at patients and the business side of the industry. This year is different. Now that voters in Colorado and Washington State have legalized the adult use of marijuana, Dixie and other MMJ companies that previously steered clear of recreational users have made the decision to start actively targeting that crowd on 4/20, using it as a way to transition their business into the new market. 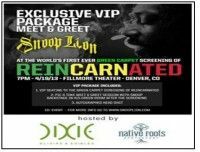 A Denver-based dispensary – Native Roots Apothecary – is also co-sponsoring the Snoop Lion event. The decision, however, could be somewhat risky for some companies from a branding standpoint, and there are potential drawbacks in other areas as well. For one, the federal government hasn’t even weighed in on marijuana legalization in Colorado, so there’s still a chance it could look to prevent retail stores from opening up. Established medical marijuana companies could therefore waste time and money marketing to a consumer base that might not fully develop. Additionally, MMJ companies that participate in events aimed at the recreational user could be seen as encouraging or condoning illegal behavior, some observers say. While marijuana use is now legal in Colorado, the state is still developing regulations tied to the production and sale of the drug. At many 4/20-related events, participants will have obtained their cannabis illegally (as no distribution model exists yet) and will also probably be violating rules tied to public smoking. To be clear, many “medical” marijuana companies have long targeted recreational users and won’t have an issue with tying their brands to the Cannabis Cup or other 4/20 events. The real issue is for dispensaries, edibles manufacturers and other MMJ companies that have solely targeted patients using marijuana for medical use. The debate between marketing toward the 4/20 crowd and patients using cannabis for medical purposes is not new, but the issue “is now divisive among those in the industry,” according to Micah Johnson, president and co-founder of Cannapages.com, which offers consultation in product quality, store presentation, niche branding and marketing. Johnson said medical marijuana companies should approach these decisions very carefully right how given all the unknowns. “It would be wise for early retail adapters to be careful with transitional marketing elements, just in case the federal hammer comes down,” Johnson said. Indeed, some MMJ companies are taking a cautious approach and have decided to continue focusing solely on the medical side of the industry. The dispensary Denver Relief, for instance, will not sponsor any type of 4/20 events this year. 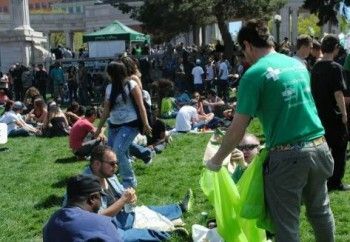 Instead, it will do what it normally does on the day: Organize efforts to help pick up litter and trash at 4/20 gatherings in Denver (see photo below) and – for the first time – Massachusetts. Khalatbari said Denver Relief is still debating what to do in terms of the adult-use market, and it could very well end up targeting recreational users down the road. But, for now, it is firmly focused on the medical side. MMJ businesses in Washington State – which is also still developing rules on recreational cannabis use – are battling similar issues. Keber acknowledges the potential risks but said Dixie is still the same company it has always been. Additionally, Dixie has slowly been moving in this direction, as it is expanding outside the medical market anyway with its line of products based on hemp oil, which the company is now selling across the US and even internationally. The 420 parties strike me as an act of both defiance and awarness fostered by long time advocates across the nation. Now that rec MJ is on the table, the 420 movement seems stronger than ever. I applaud those brands that are willing to lead the edge of awareness and caution all to act in a responsible manner. The industry needs to grow up and grow up fast to play above ground in this exciting new age of acceptance or we will remain branded as ‘just long haired hippy freeks’. Give the press something impressive to report on 4/21/13!